The Blair Witch Project began a trend that has, by now, become unwelcome and without surprises. Paranormal Activity and our own Ragini MMS may have done well in the recent past, but by no stretch of imagination can The Devil Inside be termed a movie worth watching. Yes, it follows the whole found-footage formula that is now synonymous with lack of imagination. And it deals with exorcism. The movie begins with the disclaimer that the Vatican in no way endorses the taped material nor supports recordings of similar exorcising procedures. The movie, almost in protest, does not pay too much importance to the role of the Vatican in the story, except to speak of it in hushed whispers. Maria Rossi (Suzan Crowley) makes a 911 call, in 1989. She tells the operator that there are 3 persons lying dead in her house, and that she had killed them. 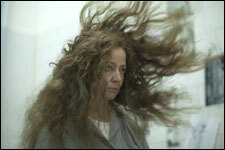 Later, the Vatican apparently intervenes, and sends Maria to the Centrino Hospital for the Criminally Insane, in Rome. 20 years later, Maria's daughter, Isabella (Fernanda Andrade) travels to Rome with documentary film-maker Michael (Ionut Grama), to meet with her mother and find out what happened. Believing in the possibility that her mother's victims were exorcists, Isabella finds herself in the company of exorcism "students", David (Evan Helmuth) and Ben (Simon Quarterman), both practising preachers. They decide to perform an exorcism on Maria, who has been docile and non-violent for 7 years now. First and foremost, The Devil Inside is a horror movie. In an effort to remain true to the genre, the makers throw in faces popping out of the dark, women in nightgowns climbing walls, and very shoddily made-up "possessed" eyes (minus eyeballs), to elicit a few gasps, no doubt. The less said about the story, the better. Maria very mysteriously goes on about Isabella's child and Ben's uncle, to add an element of mystery and darkness, presumably. The idea of transference, in which one's possessor can flit from one body to another, is handled in the most ridiculous manner, and the swearing priests cannot seem to do much about it. There has seldom been such a pointless narrative as the one in The Devil Inside. Why the devil the woman is possessed is not made clear. Satan usually has an agenda for wanting to wreak havoc in the minds and bodies of the followers of God. In this movie, you are even sure what possesses the elderly Maria. It seems more like a case of multiple personality disorder than a supernatural incident. A few questions remain unanswered. How does the Vatican have the authority to relocate an American citizen? Why does the hospital allow a camera into its makeshift exorcism chamber? Why do the priests use 4-letter words when they want to express dismay and fear? And why does Isabella want to get her mother back to the US? The actors do their bit, and not too badly. Fernanda Andrade looks a little confused, but her co-stars have a grip on their characters. Simon Quarterman and Ionut Grama stand out in their portrayals of the rebellious priest and the disgruntled film-maker, respectively. The one good thing in this senseless movie is its production design, but that can be overlooked, thanks to the terrible cinematography. If you manage to sit through the entire movie, which is not too long, thankfully, here is a spoiler-alert - The Devil Inside has the worst ending that you have seen in any movie in a long time. Remember that it is "lost/found footage", so it is not a surprise that none of the characters live to solve the mystery. Avoid this, and watch the more genuine, if laughable, The Exorcist. Bakwas movie. Not worth watching. Just by immitating Paranormal Activity and just saying that it is a movie that the Vatican doesn't want us to see, it doesn't become a hit. fullhyd.com has 700,000+ monthly visits. Tell Hyderabad what you feel about The Devil Inside!